Prior to attending the workshop: please make sure to join Team Example. Instructions on how to do that can be found here [pdf]. The Asia iGEM workshop is sponsored by Tzu Chi University. Every team MUST send at least one instructor. In the past the workshops were targeted specifically towards the instructors. This year, however, students are highly encouraged to attend as well! You only have to attend one of the three workshops, whichever one you choose, but you must attend at least one regardless of whether you are a returning iGEM team or not. iGEM is growing and changing. There will be a lot of changes in the coming years and the iGEM community needs to communicate, discuss, and be involved in figuring out what iGEM will look like in the future. Will it turn in to one large conference? What about regionals? Having the Jamboree as the only event where we all get to meet up in person is not ideal. We are encouraging teams to attend the workshops so that they can be involved in the discussions of how iGEM is changing and what the future of iGEM will be. How did you hear about iGEM and why did you get involved? 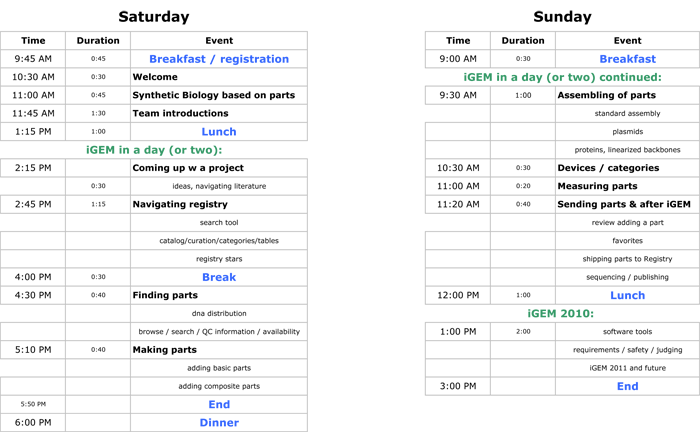 What are your expectations and hopes for iGEM 2010? What has happened at your school to get ready for iGEM 2010? Please describe the team - the students, the instructors, and the facilities available. How are you supporting your team financially? Please do not plan to give a presentation of the team's project. That will happen at the Jamboree. The Asia iGEM workshop will be held at the Tzi Chi University, Hualien, Taiwan. No.701, Zhongyang Rd., Sec .3, Hualien, 97004 Taiwan. By Air: Partipants are advised to travel by taxi(cap) from Taipei Taoyuan International Airport(TPE) to Taipei SongShan Airport(TSA) for regional flight to Hualien Airport (HUN) (Cost around USD 35). Travelling by taxi will take around 1 to 1.5 hours depending on traffic. TransAsia Airways offers 5 flights daily (USD 90/round trip). Please be noted that the airlines did not offer English website. If you cannot read Chinese, we are willing to help you with the air ticket purchasement. Please email your itinerary to Nathan Hew, e412lab AT gmail DOT com. By Train:For budget traveller, this is the cheapest way to get to our venue!You will be travelling with Taiwan High Speed Rail (Travels up to 300km/hr!!!) and Taiwan Railway. Depending on your arriving terminal at Taiwan Taoyuan International Airport, we have prepared different instructions for you. When you arrived at THSR Taoyuan Station, purchase ticket from "Taoyuan Station" to "Taipei Station" (NT$135). Then, proceed to Taiwan Railway Station, purchase ticket from "Taipei Station" to "Hualien Station" (NT$445/single trip, NT$802/Roundtrip). Please refer to the railway timetable when planning your trip. Pleaes allocate around 1-1.5 hours from immigration clearance and baggage claim, 1 hours to travel from the airport to the train station. We will be providing free shuttle service from Hualien train station to our listed hotel/homestay below. Please be noted that the shuttle service is only available from June-24 to June-25. You MUST email us your arrival time and your hotel/homestay name to e412lab AT gmail DOT com to schedule a pick up and MAKE SURE you get a confirmation from us. Thanks to NYMU-Taipei team, we are proud to offer you Taiwan Hospitality. We are glad to announce that we are determined in providing a pick-up service once you landed at Taiwan Taoyuan International Airport. Imagine after hours of flight and possible jetlag, you just need to look for your name, "Mr. iGEM or Miss iGEM" and we will arrange the following transport for you. Of course, you will have to pay for own travelling expenses and possible accomodation fee. So, if you are not looking for "independent" or "backpack" travelling experience, we are more than happy to provide airport pick-up service to our beloved guest around the globe. Although we cannot promise we could handle all guests from iGEM workshops/Asia, but we promise to do our best. Please email us your itinerary to e412lab AT gmail DOT com if you require our service. Hualien is always rated as the most-welcomed, highly on-demand travelling spot in Taiwan. Please be noted that during our workshop period (6/25-27), it is the PEAKEST travelling season in Hualien. We are experiencing difficulties in reserving hotel blocks for workshop participants, especially on 6/26. Thus, we urge you to plan your accomodation in advance. CALL NOW! Please be noted that most B&B do not provide credit card payment option. We will be providing more recommended hotel and homestay options for you soon. If you have problem communicating with hotels or B&B that we recommended, please write to us! 30 days is given on arrival for nationalities of: Australia, Austria, Belgium, Canada, Costa Rica, Czech Republic, Denmark, Estonia, Finland, France, Germany, Greece, Hungary, Iceland, Ireland, Italy, Japan, Republic of Korea, Latvia, Liechtenstein, Lithuania, Luxembourg, Malaysia, Malta, Monaco, the Netherlands , New Zealand, Norway, Poland, Portugal, Singapore, Slovakia, Slovenia , Spain, Sweden, Switzerland, U.K. and U.S.A.
UK and Japanese passport holders are given 90 days on arrival. Taroko became a national park in 1986, including Hualien County, Nantou County and Taichung County. It is the second largest national park in Taiwan. Taroko is famous for its spectacular mountains and marble canyons. Cisingtan Scenic Area is the only county-level scenic spot in Hualien County which is connected to Taroko Gorge, East coastline and East Rift Valley. Carp Lake is the largest inland lake in Hualien County. It earned its name because of the shape of mountains surrounding the lake.